Finn seems to have developed a particular interest in women's accessories as of late. 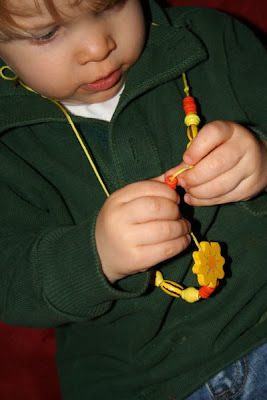 He was so taken with Elizabeth's new wooden bead set that she finally just made him a necklace of his own. He wears it incessantly, and we have to pry it from his clammy hands at bedtime for fear of him choking in the night. After the necklace obsession had been going on for several days, I turned around last evening to see that Finn had seized my alpaca scarf and wool slippers as his own. He shuffled along for much of the evening trying to play with his cars, encumbered by unwieldy embellishments. My Max went through that phase too, and looking back it was a definite precursor to his dress-up obsession. 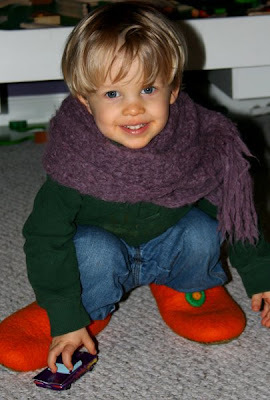 He wanted to wear all of my necklaces, my scarfs, my hats. He's traded most of that in for capes and masks and shields and swords these days, but on occasion, I still find him emerging from my closet with a paisley belt or wooden bracelet planted firmly on his arm. And I smile. Oh, how I smile. so cute! I love this phase when they are just enjoying all the tactile and visual experiences the world has to offer before the "that's a GIRL thing!" sets in! Our best friends son who is now 13 used to dress up in dresses with my oldest daughter when they were 4. We have pictures of them. Blackmail pictures!